Looks like Mom's dress is hung in the door. "Make sure you don't crunch that NOS left fender." I think the angle of the wheel is due to the film in some old box cameras would curl slightly near the edges. That can cause that sort of distortion in the photo. Parts of the house also appear distorted a bit. What I find most interesting about this photo is the wire wheels! I really wish I had started an absolute list of ALL original brass era T photos showing wire wheels on a model T. There is no way to go back and build it from my past. Wire wheels were available for automobiles from before 1900 in this country, even earlier in Europe. Several companies offered them and sold them for any car you could want them for from before the model T started production. There is no debate. Wire wheels were available, they were sold and installed onto model T Fords almost from the beginning. BUT THEY WERE NOT A COMMON ACCESSORY on model T Fords! Especially during the brass era. There are probably more brass model T Fords on the road today with wire wheels than there ever were prior to 1917. 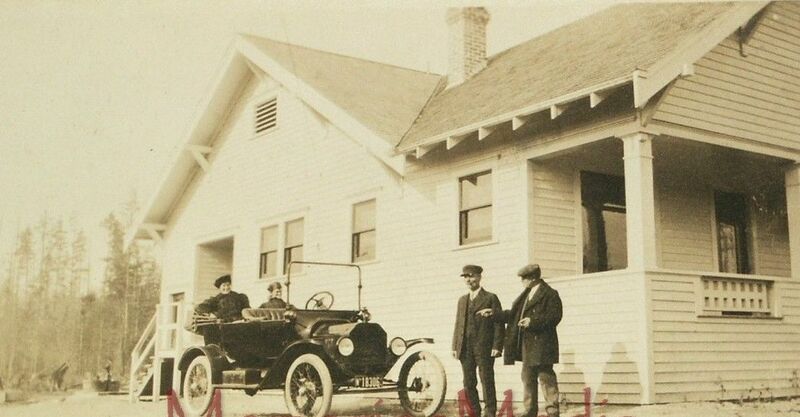 I cannot identify the license plate to pin it down, but the car IS left hand drive, and the house is a very typical 1910ish USA construction and style. Edsel Ford had a special touring in 1915 that had wire wheels, for awhile before they were changed back to wood spoke. This car does not appear to be his. His had a custom cowl vent door, and I see no sign of that here whatsoever. Great photo! Thank you, Jay. It is never too late to start cataloging things. While you probably won't capture some that you saw in the past -- this one is ready for you. Note also that the very early wire wheels in the USA -- on the curved dash Olds etc. were very week laterally. It was not until later that they started having the offset lacing that gave them much more strength for cornering. I'm always unofficially looking for folks to help gather information on different areas related to the Ts. I would really appreciate it if you would start you file and make it available for an eventual publication/sharing etc.